On the skywatch base members Fuji and leader Battalion spar in the training room while terrorists hell vital security information make their way onto the base and kill all in their path. They catch up to our duo and get their asses soundly handed to them. The leader Marco still swears revenge on Battalion for the death of his brother. They turn him over to the authorities even though battalion wanted to kill him for murdering twelve people to get to him. Battalion retires to his quarters when his superior Christine asks him the history of the situation since she can’t access the case file. He refuses and once she’s gone he remembers the origin of superpowered beings on their world and the origin of stormwatch one. After their training had been completed himself, flashpoint and nautica are attacked by Marco, his little brother and their crew who are members of the third world liberation front. The terrorists are defeated and battalion accidentally kills Marco’s brother. He captured but vowed revenge. In the present Battalion sheds a tear as he remembers the death of his friend John and how his dream of a peaceful world has now become the fundamental of Battalions life. He vows to live by that credo so his little brother Malcom can live a normal life. Great cover art- Showcasing Whiplash, flashpoint and nautica. The blue crackle of energy accentuates the dynamic cover in all the right ways. Interior art- I loved every panel of the interiors, even by today’s standards this is a beautiful work of art. Details, colors and the page quality itself all came together seamlessly. 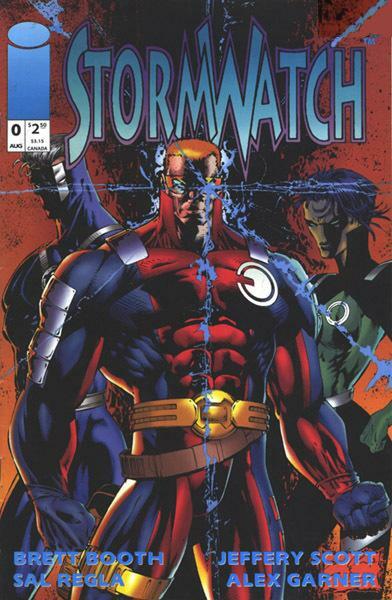 Origins- In this issue we learn about the origins of the Stormwatch; formed by the United Nations to police the whole globe. The origins of the superbeings of this world are also revealed; when the first shuttle to monitor earth was launched, monitor 1, It was supposed to be the dawn of a new day on earth but the ship was caught in the tail of a mysterious comet which killed most of those onboard but changed on a genetic level those who survived. 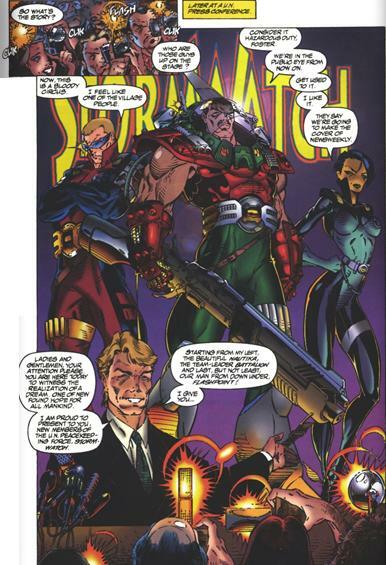 The warguard as they were called became a liability but their children became known as seedlings and possessed the ability to become like their parents, superbeings. Stormwatch uses these seedlings to protect the world. Characaterization- Jackson is the star of the book which is great since he has the most baggage going in; A powerful father who went rogue, a strong senses of duty, quick temper and very protective of his younger brother Marcus. 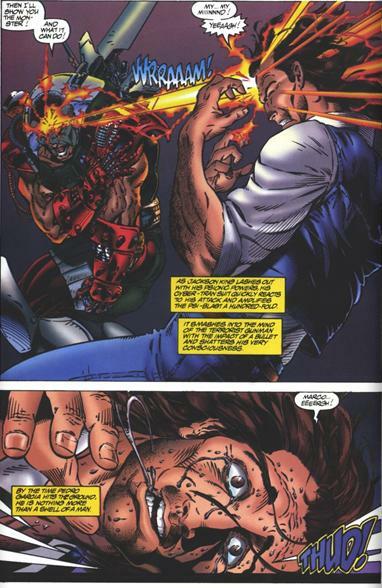 Other great character were Flashpoint who’s a powerful Australian with Optic powers and control that would make the x-men’s Cyclops cry. The villain was also simple enough to be relatable though he was not a threat worthy of our teams time. All in all a god staring point for the stormwatch series, it lays the groundwork on which all of the numbered series will follow. Good stuff!! Lost of exposition give the tale a rather long winded feel reminiscent of 90’s comics. Nautica felt like she was just on the team so we could have a female member her presence was not felt at all. ← Michael Jai White’s Black Panther!